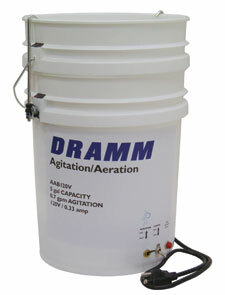 Manitowoc, WI- Dramm is pleased to offer a new system for agitating solutions for use with injectors. The new Agitation/Aeration Bucket is perfect to keep water soluble fertilizers, insecticides, fungicides and PGRs in solution during application. The new bucket also offers air injection to keep nematodes or other microorganisms requiring oxygen alive during use. The new Aeration/Agitation Bucket is available as either an AC or battery powered system, offering flexibility in how the unit is used. For more information, visit our webpage, contact us at the numbers to the left or email with questions.